The seasons help mark the passage of time. While the extreme summer heat or the extreme winter cold may be at times irritating or even hazardous, there is always beauty to be found at any given time of year. Booked.net ran a campaign “Capture the Seasons” (2012), and Erik Smith kindly nominated me. I realize it’s spring when an explosion of colours lie in wait wherever I’m traveling. 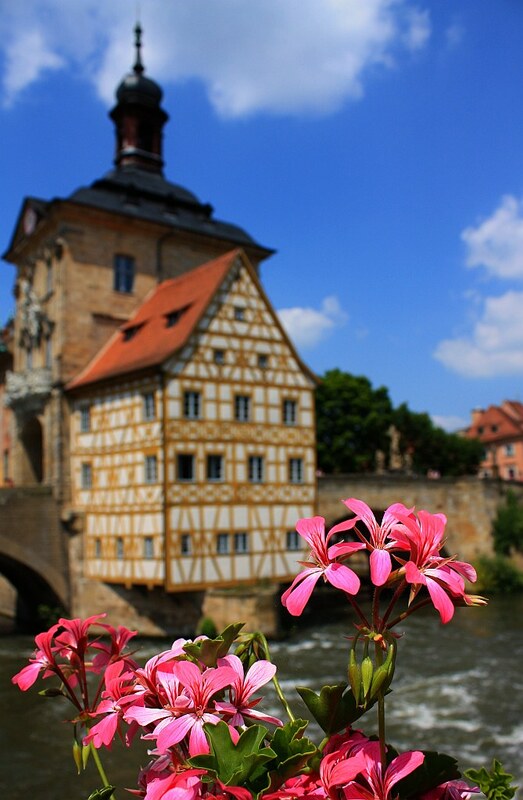 A beautiful set of flowers provided the perfect foreground to the Old Town Hall in Bamberg, Germany. It’s not enough that the Old Town is recognized as a UNESCO World Heritage Site, but there are beautiful flowers present everywhere in town in springtime. I realize it’s summer when it’s time to hop on a boat to cool off. In Hamburg, you can take a cruise through the city canals and visit some of the most exclusive neighbourhoods in town. 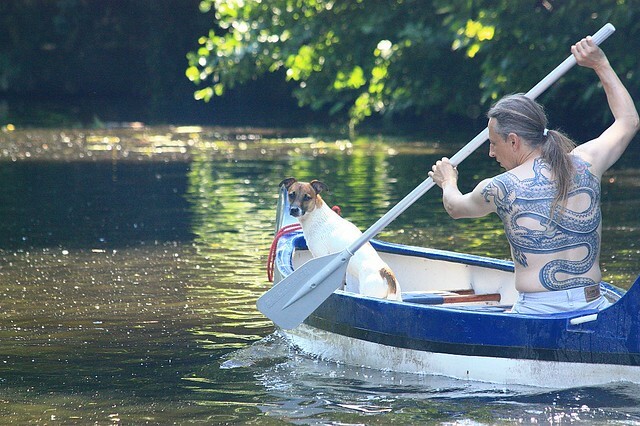 Then again, after watching this gentleman canoe down the Goldbekkanal, I believe that this man had a very “exclusive” insight to taking things easy in Hamburg. I realize it’s autumn/fall when deciduous trees change colours, and the annual cycle continues with leaves falling onto the ground. While walking within the interior courtyards of the Heckmannhöfe in Berlin, I found three giant leaves on the ground and placed them on the bench. 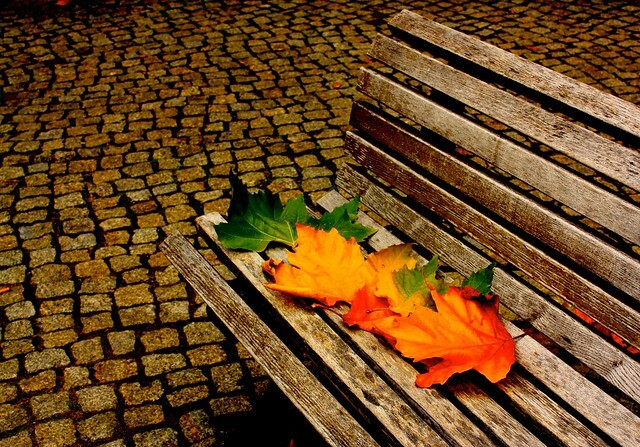 The brightly coloured leaves, the brown earthy colour of the bench, and the red-brown bricks on the ground formed a wonderfully representative image of the season. I realize it’s winter when Christmas lights are out, and the sights, smells, and sounds of the Weihnachtsmärkte (Christmas markets) in Germany are in full swing. 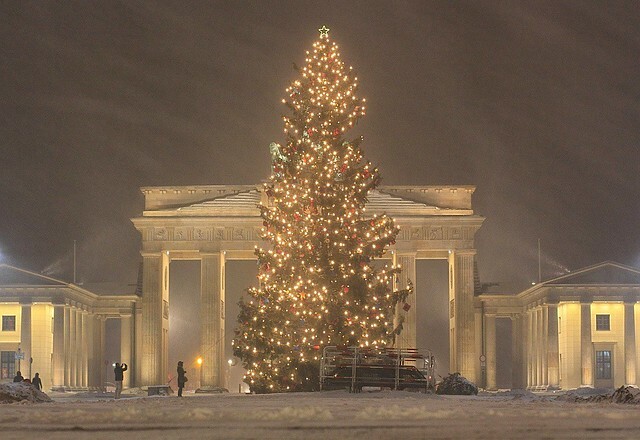 On Christmas Eve 2010 in Berlin, I made my way to a quiet Brandenburg Gate in heavy snowfall and gusty winds. The Christmas tree-lights and the streaks of blowing snow combined to make a great winter picture. Disclosure: No Connection, Unpaid, My Own Opinions. I have not received any compensation for writing this content and I have no material connection to the brands, topics and/or products that are mentioned herein. I made the four photos above between 2008 and 2010. This post appears on Fotoeins Fotopress at fotoeins.com. Nice Work! Thanks for participating! Thanks, Erik, and thanks for the nomination! Hi! Thanks for highlighting both fall and summer photographs from my post!